Thanks so much for visiting my website! My name is Jessica. I’m the mother of two beautiful daughters and I do lot of juicing. What’s the hardest part about making green juice? Finding the right juicer. It took lots of trial and error (and even more money) to decide what is the best masticating juicer (a.k.a cold pressed juicer) on 2019 market. With all the choices out there, I want to help you find the best masticating juicers for the money without spending a fortune. I hope my experience makes your search for a juicer a little bit easier. I try to keep my reviews short, but I know you’re busy and may not have time to read them all. I put together a comparison table to give you a brief overview. Why I Choose Omega NC900 Over Omega J8006 as Best Masticating Juicer on the Market Right Now? NC900 feeding chute is 82% larger than J8006. NC900 has a drum cap that is adjustable to five positions, so can manage pulp output. J8006 is static. NC900 has a stronger, larger screen, resulting in a higher yield of up to 25%. NC900 is entirely devoid of BPA during the manufacturing process. As you’ll see, although the NC900 HDC is slightly more expensive than the J8006. It produces far better results! Please see below for further thoughts on my favorite juicer of them all. I consider this juicer to be the pick of the bunch for three main reasons. It offers the greatest nutritional value of any juicer on the market; it provides amazingly high yields; and it’s very fast and easy to clean! These are just some of the reasons to recommend this horizontal masticating juicer. Perhaps more important, though, is that the nc900 has an extremely high nutrition level. This is because the nc900 uses a single gear to juice fruits and vegetables, working at the low speed of 80 RPMs (rotations per minute). As well as generating considerably less foam than a double-gear equivalent, this ensures that you’ll receive maximum fiber from your ingredients, and much higher yields. This means that you’ll most certainly receive value for money if you use the nc900, and you’ll feel great! By using this more sedately paced approach, the machine does not generate too much heat. This is very important in juicing; a lower temperature means healthier juice that retains every possible nutrient that was found in the original fruit, and it stays fresh for longer. Perfect for those mornings where time gets away from you, and a pitcher filled with freshly squeezed juice ends up stored in the refrigerator for later! Perhaps best of all, there are also no restrictions placed on what can be juiced by, this machine. Naturally, it can handle all kinds of soft and traditional citrus fruits such as oranges, lemons and limes, but there is also plenty of variety available. 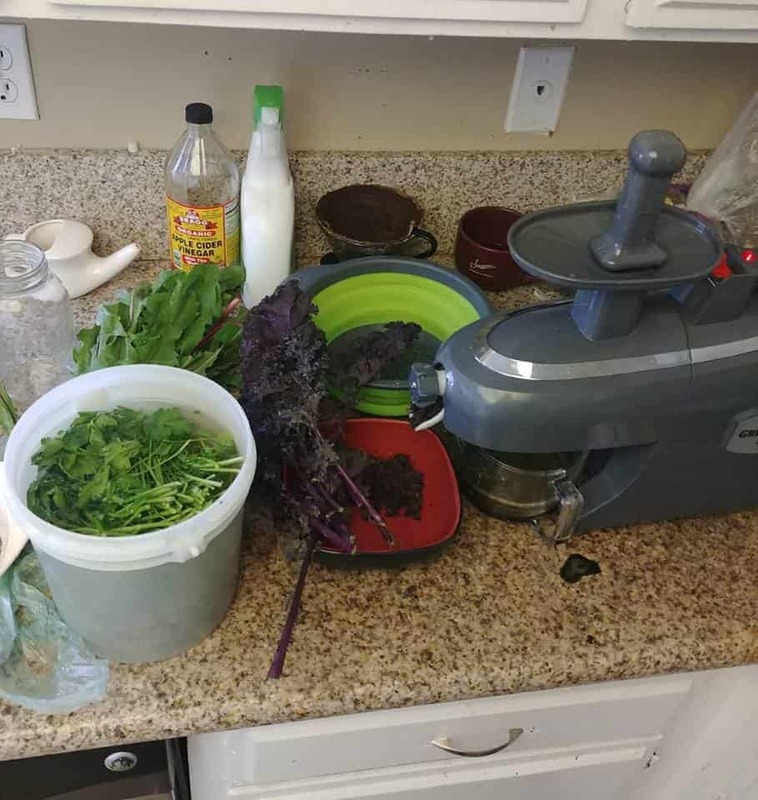 I use my Omega to make juices from a selection of different leafy greens and healthy vegetables like celery, as the resulting juice retains all the fiber and goodness found in the veggies. NC900 can also grind up stubborn coffee beans, convert solid nuts into spreadable nut butter (you may just need to add a little oil afterward), and even create desserts such as sorbets. You can also place raw, solid food into the nc900 and have it mashed and pureed, making instant baby food. I wish I had this gadget when my girls were tiny! In addition to a hugely impressive 15-year warranty (though I’m confident that you won’t need it! ), this horizontal masticating juicer has an impressively large feeding chute. It’s also blessed with a truly state of the art look, especially with the eye-catching silver plating that means it will stand out in any kitchen. 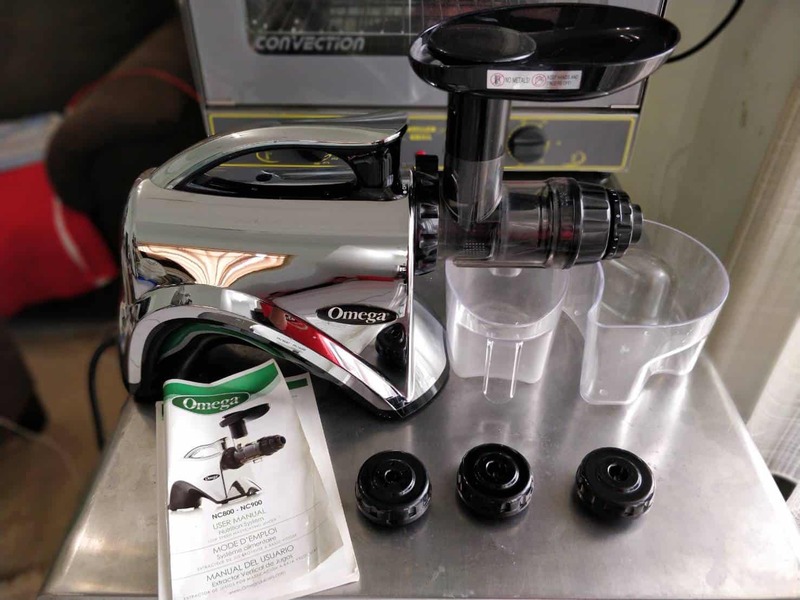 Easy to clean and as versatile as anything on the market, I’ll simply repeat what I said earlier; the Omega nc900 Nutrition Center is the best single auger masticating juicer on the market today. 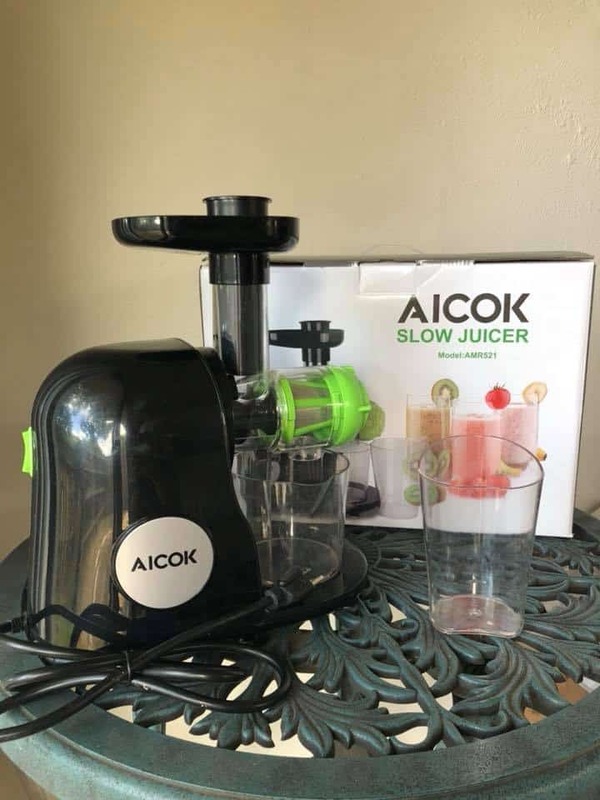 I can confidently say that Aicok slow juicer is the finest budget masticating juicer available today. 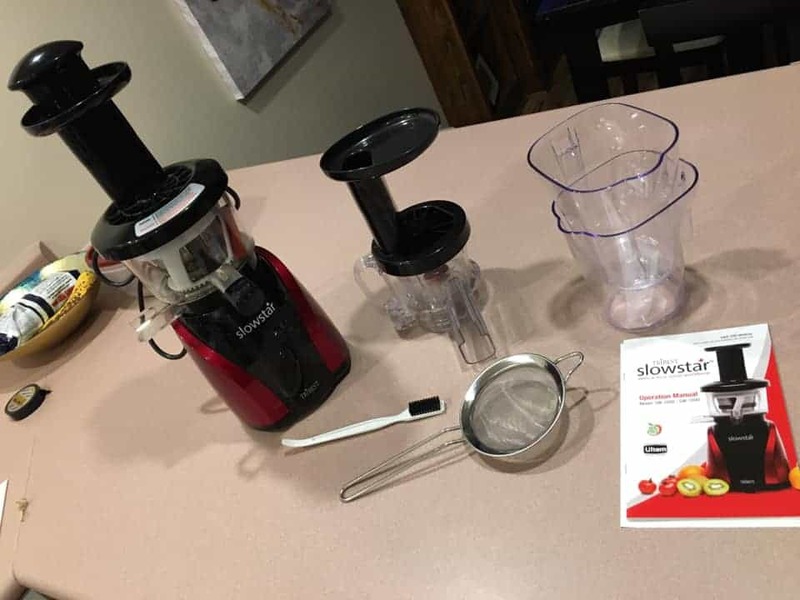 I promised that I would be able to find a safe, reliable and cheap juicer for any family on a budget, here it is! Higher costs sometimes lead to superior products, but this is a perfectly high-quality juicer that will not break the bank. It may not be quite as elaborate as some of the other juicers that I review. However, if a reasonable price is your priority, and you are shopping at the lower end of the budget scale, this is the product for you. It comes in a striking shade of black that will make a bold statement for your kitchen. Standing at 13.8 x 11.1 x 9.8″ and weighing a little over 9 lbs, it’s also not difficult to move if you decide to redecorate. This is a slow masticating juicer, which means the auger will spin at the steady pace of 80 RPM, at a very low and quiet volume. This means that even though the appliance is not as expensive as some competitors, it will still produce high-quality, fiber-dense juices. Patience is rewarded to anybody making use of this juicer, as you’ll be tucking into a delicious drink straight from the device with very little foam to contend with! A slow-moving juicer also means that the appliance is less likely to clog up, which is welcome news when it comes to cleaning. This device can be easily pulled apart for cleaning, while it’s also dishwasher-safe if you prefer not to get your hands dirty. Try not to use the device for more than fifteen minutes at a time without a rest, though. This could cause the blades to seize up, which will have a negative impact on your next juicing experience. This may be a cheap masticated juicer, but in no way is it an unreliable one. You’ll receive a three-year warranty from Aicok if you decide to purchase this model, but from my experience it should not be required. I have found this juicer to be perfectly reliable, and it did not let me down when I fed solid vegetables into the chute such as raw carrots. You will also have a similar amount of success with foodstuffs such as wheatgrass and leafy greens. I found it to be particularly effective for making juices from green superfoods like kale! If you’re on the lookout for the best budget masticating juicer available on today’s market, you really can’t go wrong with this model. If you don’t want to spend time chopping and cutting your fruit and veg before juicing, this the best model for you. Some people find the idea of peeling and chopping a variety of ingredients intimidating. The Kuvings Whole Slow EVO820GM eradicates this issue, juicing whole ingredients. As you would expect, this juicer has a very wide chute to accommodate whole foods. In fact, it’s the biggest chute of any commercial model, measuring 82mm – big enough to fit an entire apple in one feeding. This will allow you to feed all kinds of goodness into the juicer with no fuss. The EVO820GM then proceeds to slice these vegetables at a rate of 60 RPM. That’s pretty slow by professional juicer standards, and it ensures that any and all nutrients are retained throughout the process. This model of juicer is very simple to assemble and take apart. The entire bottom of the juicer can be removed, making it simple to clean. There’s also a hole that ensures that captures pulp, ensuring that your juice can be tailored to tailored to your family’s taste preferences. It’s also very quiet, despite running a powerful motor of 240W. Of course, such a substantial juicer means that you’ll need to ensure that you have the appropriate space in your kitchen. The EVO820GM stands at 8 x 9.5 x 19″, making it a little bulkier than an average model. 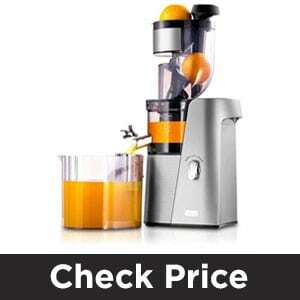 If you can accommodate this juicer, however, you will find that it meets all your needs. In addition to standard fruit and vegetable juices, this model also creates frozen sorbets and smoothies. You can also use the EVO820GM to create baby food or nut milk. A 75-page book of potential recipes is also included in the asking price to provide inspiration if necessary. The Kuvings Whole Slow EVO820GM may not be the cheapest juicer on the market, but it’s among the most stylish and impactful. The finish of this model is gunmetal gray, with a black leather finish. This ensures that this juicer will take pride of place in any modern kitchen, ensuring that high-impact yield and performance is matched by aesthetic splendor. If you’re time-poor and want a juicer that’s easy to use and clean, this is the one for you! If you are looking for a juicer to use in business, or a professional equivalent for the home, consider the Green Star P502-B. This horizontal juicer enjoys commercial certification in electric goods, and ETL Sanitation Certification. This is the equivalent of a seal of approval from the all-important NSF International. This professional-standard juicer runs at 110 RPMs, but no nutrients or vitamins are sacrificed as a result of these rapid rotations. This is thanks to the addition of bio-magnets to the juicer’s gears. These magnets ensure that every possible mineral available from the ingredients of your recipe is pulled into the juice. The human body can then easily absorb them while you enjoy the results. A professional-standard juicer should be expected to handle heavy loads. This model has a duty cycle of 30 minutes, which is not quite as long as other models. However, the fast and rapid rotations ensure that you can achieve a lot in that half-hour! One of the selling points of the P502-B is the three-tier juicing technique. This includes crushing and masticating the ingredients, before rubbing and mixing them together. This can only be achieved by the P502-B, thanks to unique components found within this model. Once this second stage is complete, the juice will be squeezed and released. If you are going to invest in a professional juicer, you will understandably hope that you will need to upgrade or replace it any time soon. 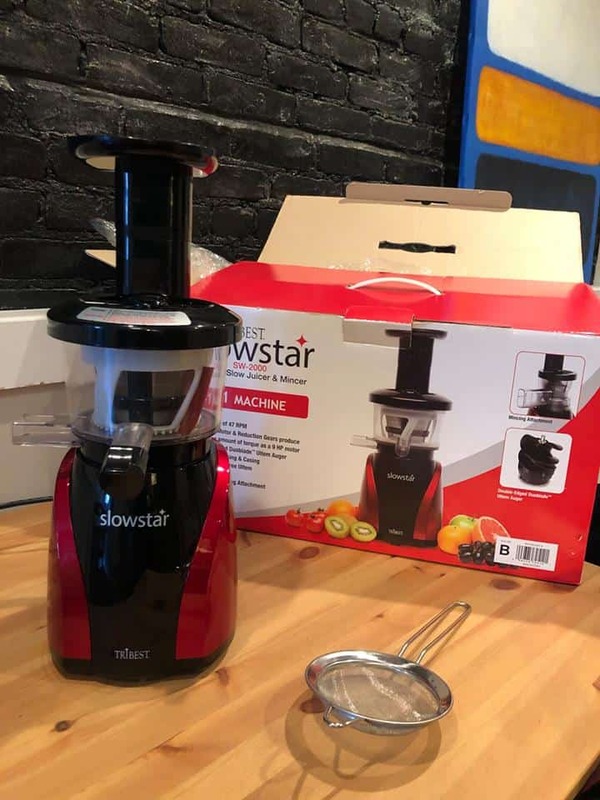 Green Star agree, which is why this juicer comes with a 15-year warranty. That’s the longest of any model on the market! This juicer is also constructed entirely from stainless steel, which means that you don’t need to worry about plastic components cracking and breaking through wear and tear. This juicer is most effective when used with hard vegetables. The yield of carrots and other root vegetables is amazing! If there is a flaw to this model, it’s that it struggles a little more with lighter, softer ingredients. Mixing and alternating between hard and soft fruit and vegetables ensures the best performance. Overall, this is a fine juicer. It’s a real bonus to be able to pick up a professionally certified model at an affordable price, and the lengthy warranty means that there’s no need to worry in the unlikely event of experiencing a problem. Sometimes, only professional quality kitchen equipment will do! I would say this is the quietest and best slow juicer on the market. If you hate being woken up on a lazy weekend morning by the clanking and grinding of a kitchen appliance, consider this model. It’s virtually silent, ensuring that your family can enjoy a nutritious liquid breakfast without disturbing anybody! We are all busy people, so the idea of a slow juicer may not initially sound appealing. After all, why buy a product that takes longer to do something that could be fast? 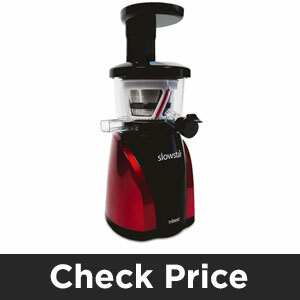 In the case of the Slowstar SW-2000, it’s because the juicer is as quiet as a mouse. The Slowstar brands itself as a 2-in-1 machine, which is a result of a homogenizing attachment. This is attached to the top of the juicer, and I found it to be hugely useful. Like most of the best juicers, this model can create all kinds of diverse and delicious items such as dessert sorbets or sauces. A very welcome bonus, on top of the super-healthy juice! You can even mince food through this attachment, too. These additions are all very welcome, but the real selling point of the Slowstar is that super-slow motor. Some slow juicers find this snail-like pace problematic, and I found that other devices that move at a similar rate offer a lumpy, unappealing juice filled with chunks and pulp. This device avoids this problem by using an auger described as a Duoblade – a double-edged slicer that does twice as work in half the time, ensuring that the slow 47 RPM does not compromise on juice quality. Fruit and vegetables are also less likely to jam thanks to these twin blades, and the end result is less pulp in your juice. It’s also perfect for stringy vegetables, ensuring that your kale and spinach comes out ready to drink. I had a great time with the Slowstar, and really I do recommend it to anybody that might find it helpful. It’s nice to look at thanks to the red-and-black design, and the construction is almost entirely BPA-free so it’s safe too. In the unlikely event that you do have some kind of problem with the Slowstar, you’ll also receive a ten-year warranty from Tribest. It’s really hard to look past this model as the best slow masticated juicer that money can buy! When it comes to choosing which juicer will serve you best, there are lots of considerations. For some families, the most important factor will be cramming as much into their juicer as possible. If this applies to you, consider this model from SKG. It’s the best wide chute masticating juicer around, so you’ll be able to feed plenty of fruit and vegetables into a single session! Like all the juicers that I’m discussing here, this device runs at a slow rate to ensure that all possible nutrients are retained. In the case of this SKG model, the blades operate at a sweet spot between the other juicers that I have discussed, namely 43 RPMs. This makes for a great combination of pressure and speed, as it the juicer does a very thorough job of liquidizing the fruit and vegetables without sacrificing goodness. This juicer has a very high yield, anybody that hates pulp will be delighted to know that it’s kept to a minimum by this particular appliance. The juicer weighs around 20.5lbs and stands at 16.8 x 12.1 x 14.2″. It’s a colored in stylish silver, and the components are entirely BPA-free so there’s no need to worry about health implications. I also found the assurances and customer service offered by SKG to be very welcome. 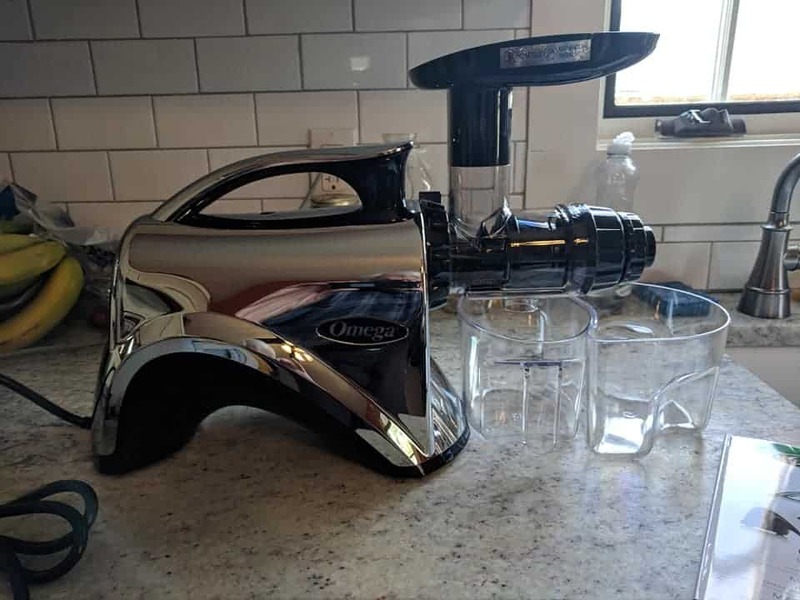 You’ll be able to trial this juicer for a month, and if you do decide to buy it the warranty covers parts and accessories for two years, and the motor for a full ten years. It’s that wide chute that’s the real selling point of this juicer, though. At 3″ you can get plenty of root vegetables through the chute at a time. I found that this saved a huge amount of time, both in terms of chopping the solids before juicing them and in standing over the appliance. In addition to this, the wider chute means that the juicer blocks less often. That, of course, means less cleaning for you! This time saving comes in very handy, as if there is one minor snag with this juicer it’s with how long it can perform without a break. This particular appliance will find itself struggling if used for more than ten minutes consecutively. However, the wide chute means that you can get more juicing done in those ten minutes than some competitors can offer, so it’s a fair trade. I stand my assertion that this is the best wide chute juicer available right now! If you have a business that relies upon serving delicious juices, you’re going to want the best commercial masticated juicer possible. That comes in the shape of this model from Champion, which is aptly named. This appliance certainly outperforms all of its rivals in the commercial juicer field! Your outlay on this juicer will be complemented by a ten-year warranty which is very welcome, and the model is available in either black or white. Just bear in mind that, if you choose a bright white juicer, you could be facing a great deal of polishing and cleaning to prevent discoloration! Thankfully cleaning the interiors of the appliance is very simple. Weighing 23 lbs, this is certainly a heavyweight appliance. It has a performance to match this status though, and does not struggle with vast quantities of produce being fed through the device in quick succession. It’s very hardwearing and will be able to cope with most raw foods, though you will have to chop things down to size in order to fit them into the chute. The good news is that you won’t need to stop and allow the machine the rest very often, though. I would just like to repeat that this is a commercial juicer, designed for a lot of output. This means that it may not be perfect for a small family kitchen. You’ll need a large vessel to capture the juice when the fruits or vegetables have been masticated, for a start, and you could end up with more waste than you are comfortable with if you are just looking for a solitary glass of juice to have with breakfast. It should also be noted that the powerful engine of this juicer runs a little hotter, meaning that the juice may not stay fresh for quite as long. If you’re looking to produce substantial quantities of juice for rapid consumption, however, it’s really hard to look past this model from Champion as the best commercial masticated juicer on the market. It will be perfect for anybody following a strict juicing diet or hoping to commercialize their ability to make juice. You can have an affordable masticating juicer without sacrificing performance. This Bigg Boss Cold Press Heavy Duty contains a powerful 150W motor. Like other masticating juicers, it presses fruits and vegetables to slowly extract juice from their cell walls. It’s is a great option for an affordable masticating juicer. Kuvings NS-850 Silent Juicer slow speed squeezes nutrients and enzymes from produce without accelerating their oxidation. It has the compact size and sleek design you want in an upright juicer, and its two-step safety start system. Best of all? It’s one of the quietest juicers on the market. The general information articles are a great place to start before reading the masticating juicer reviews. My buying guide is a great place to start. It will teach you what to look for in a masticating juicer so you can decide for yourself which is the best juicer on the market. Knowing the basics will help you decide which juicer has it all and which ones are missing the features you need. How exactly do masticating juicers work? How does a masticating juicer change food from solid to liquid? Read this article to learn how the top rated masticating juicers work. After you understand what makes juicers work, reading the masticating juicer reviews will be much easier. Some of the most important factors when choosing a juicer is its speed, its auger, and its voltage but what do these terms mean? Here’s an article that explains the meaning of these important terms and how they apply to masticating juicers. With all the options out there, it’s hard to know which is the best brand of juicer for your particular needs. Here are the masticating juicer brands I like the most. Omega’s line of masticating machine are top notch. Their variety of juicers to fit different needs and all exhibit the highest in performance. I’ve also had great experiences with their customer service team. 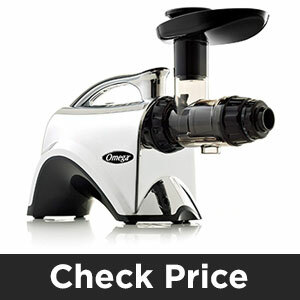 Choose Omega if you want a variety of high quality masticating juicers to choose from. 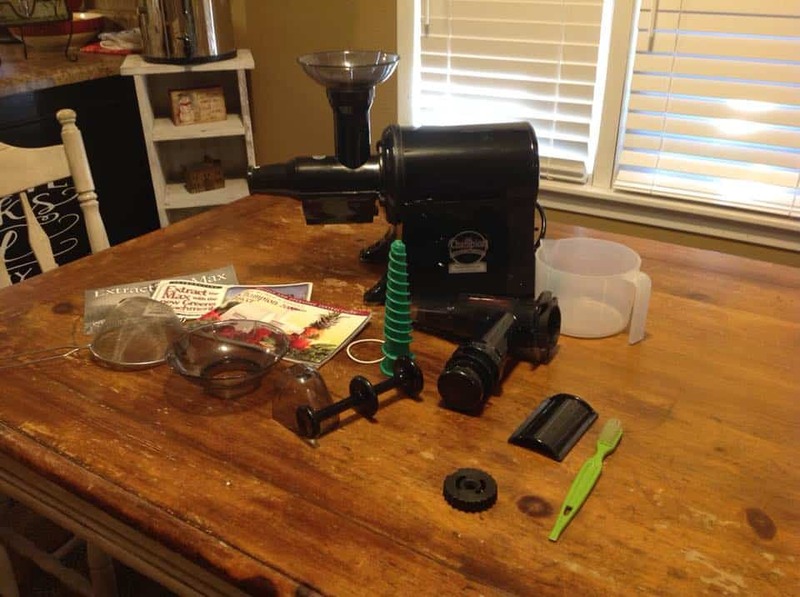 Here’s more on my experience with Omega juicers. Hurom is a 40-year-old Korean brand committed to bringing healthy solutions into everyone’s home. They take the design of their juicers very seriously and have won numerous awards for their machines’ ingenuity. Their Slow Squeezing Technology extracts a high amount of juice while maintaining the color, enzymes, and nutrients of each fruit and vegetable. With a big name to live up to, Champion juicers don’t disappoint. Thes company’s been making juicers since the 50s so they know their stuff. Their small selection of juicers makes it easier to decide what’s right for you. The same great features and high performance are represented in each machine. The sleep European design on each Kuvings juicer is the perfect balance of style and function. Its machines boast some of the largest shoots in its class, letting you insert fruits and vegetables whole without cutting. The result is smooth, nutritious juice made in half the time. The noise of a juicer is very important. Since I’m the first to rise in my family, I always look for juicers that won’t wake my kids and husband. If you live alone, noise may not be a big factor, but it’s something to consider when looking for a juicer. Masticating Juicers come with lots of moving parts that all need to be cleaned thoroughly to prevent the growth of bacteria. I never suggest putting juicers in the dishwasher. They need an immediate and thorough scrub down after each juicing session. But some juicers are easier to clean than others. In my masticating juicer reviews, be sure to look out for cleaning time. An easy to clean juicer can save you lots of headaches. In the world of affordable masticating juicers, there are an array of options each juicer will have. Depending on your lifestyle, some of those options will be must-haves while other will be nice but not necessary. It’s impossible to juice if you can put your juicer together. Some masticating juicers are a lot more complicated than others, so you want to look for juicers that are relatively simple to put together and take apart. What is the Best Masticating Juicer on the Market? If you are looking for something that can serve multiple functions and is cost effective, then look no further than the Omega NC900 juicer. It can be used not only to make juices, but nut butters and baby food as well. The two stage processing system it uses allows you to get a greater yield from your produce. Since the NC900 is a low speed juicer, it will retain more nutrients as the heat sensitive enzymes will not be destroyed through the processing. Powered by a 110-volt motor, the Tribest Green Star Elite can apply maximum torque while still moving slow so as not to generate heat and destroy any nutrients. It features a specially designed mastication system that imitates human teeth and chewing. The preparation time as well as cleanup are minimal for this juicer, making it a great option for people who are short on time. 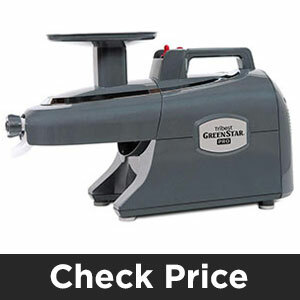 With extra features for homogenizing and pasta making, you are sure to get your money’s worth from the Tribest Green Star Elite. Is a Masticating Juicer the Same as a Cold Press Juicer? Yes! The masticating juicer is also referred to as a cold press juicer because its process generates less heat which will preserve more of the nutrients and actually yield more juice as well. A twin gear juicer works with two gears that rotate inward to crush, grind and pound fruits and vegetables into fine particles. This action breaks the cell membranes to allow the nutrients and minerals to be used by the body. It operates at a very low speed of around 80-160 rpm. This eliminates oxidation to the juices and avoids the production of any foam in the juice. How long can I keep my Cold Pressed Juice? This is a tricky one to answer definitively as it can depend on several factors. For one, using good quality produce is very important, and also what you put in your juice. Adding something with a low pH (acidic) like a lemon, will have a longer shelf life. You’ll also want to keep the juice refrigerated (at or below 41 F) in order to preserve the nutrients in the juice. If you do all of these things, you should be able to keep your juice for 3-4 days. Is Cold Pressed Juice Good for You? A juice containing fresh fruits and vegetables is a quick way to get a load of vitamins and minerals in one sitting (or on the go). The slow processing and low heat method of these juicers also produces less oxidation and therefore destroys less of the heat sensitive compounds. However, you cannot rely on juices alone to provide your body with nutrients. Juices can certainly be an important part of a healthy diet, but don’t forget to eat your veggies as well! No. The Nutribullet is not a juicer in the traditional sense, it is actually a high speed blender. While it can make juices, it doesn’t work the way and true juicer boes. A juicer will extract the juice and filter out the pulp, but the Nutribullet will not. Instead, it pulverizes the fruits and vegetables and leaves in the broken down pulp. This results in a much thicker juice, which many people actually prefer, as it still contains all of that important fiber. What is a Pressed Juice Freeze? This is the newest creation from the California-based Pressed Juicery. It is a soft serve frozen dessert made with their signature fresh juices, currently being offered in six unique flavors. The dessert is vegan and gluten-free, making it a great choice for anyone with dietary restrictions. Currently the dessert is only being sold at the store’s Palo Alto location, but they plan to open several more Southern California locations in the near future. What is Special about Cold Pressed Juice? Cold pressed juices are certainly having their moment right now, and that is because of the technique used to make them. As the name implies, the juice is extracted with a non-heat method, which allows for most of the nutrients to remain intact. Since some enzymes are heat sensitive, using a high powered juicer can possibly destroy them. This is why many people prefer cold pressed juices. How Long does it take for Fresh Juice to Lose its Nutrients? As soon as you break open the cell walls, the fruits and vegetables will begin to oxidize and lose their nutrients. To get the maximum amount of nutrients from your produce, you should consume the juice within 20 minutes. However, you can get a bit longer shelf life depending on what type of juicer you use. For slow (or masticating) juicers, you can expect a juice to last up to 72 hours with minimal nutrient loss. Can I Freeze The Juice after Juicing? You certainly can freeze your juice. While it is still ideal to consume directly after juicing, freezing is a good option for those who want to prepare a batch ahead of time. Freezing will preserve most of the nutrients and is a much better option than drinking juice that is several days old. Finding the right juicer can be a daunting experience. How do I know? Because I bought lots of juicers before figuring out which one is right for me. I want to take my trial and error experience and use it for your benefit. 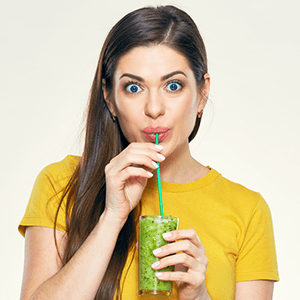 This site will have my honest, unbiased review of dozens of juicers to help you decide which is the best masticating juicer for your needs. 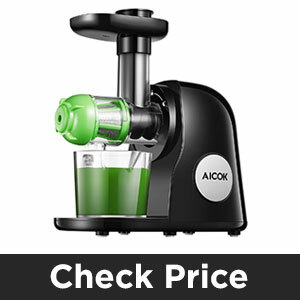 My wish is that this site saves you the countless headaches I had when searching for a juicer. Use my experience for your benefit and browse my masticating juicer reviews to see for yourself. I started using Omega J8004 after the birth of my son Jason. As a new mother, I needed some additional nutrients. Best way I found based on my doctor’s advice is to take juices. And therefore, I bought my first juicer Omega J8004. The juicer was really good with all types of ingredients. Even it was capable to juice wheatgrass and other leafy greens. I frequently juiced spinach and kale. The design was very nice and some of my neighbors were really inspired to buy this juicer. Last month, I shifted my residence to a small flat comparatively previous. Kitchen was also a bit smaller. Due to the tiny space I thought to change juicer and planned to buy a vertical juicer. I didn’t want to buy any conventional vertical juicer but something that can fulfill my requirements. My intention was getting a juicer that is smaller in size, but effective and can juice any type of fruits and vegetables. I love juices of watery fruits and leafy greens too. Actually, I am fond of spinach and kale juices. I am now confused what vertical juicer can I purchase that meets my needs. Do you have any idea that can help me, remember my requirements please? Yes Sandra, for small kitchen vertical masticating juicer is best. Since vertical juicer have small footprint. 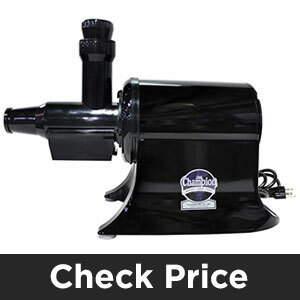 For your specific need Tribest slowstar SW-2000 is the best juicer for kale and spinach. Handle fruit and vegetables including leafy green easily. Bonus, you will get a Mincing Attachment too.